Lola is a wife, mother of three, grandmother of eight, and great-grandmother of one. She came to the land in the fall of 1979, and is one of the founding members of The Ojai Foundation. She was a board member and co-chair of the board with Jack Zimmerman. She was a staff member for twenty-four years, holding various positions where she had the opportunity to learn from many of the great teachers who came to the land, as well as from the people who were part of the staff, board, and community. She became a teacher, working with schools to develop and participate in Rites of Passage youth programs for twenty years. She helped to develop the youth team to work with expanded school programs. Lola was work retreat coordinator for ten years and she helped to develop a work-retreat program that included Rites of Passage. She has participated in staff, board, work-retreat and community Councils since the early days at TOF, and she has co-led Council I, II, & III. Lola is a potter and has taught pottery workshops and hosted a variety of workshops with well-known potters on the land. 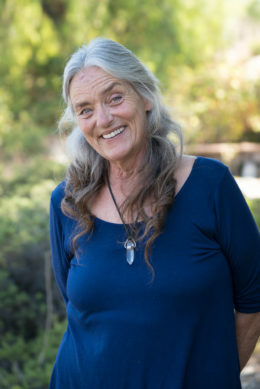 She continues to serve as a mentor and teacher at The Ojai Foundation, offering the Medicine Wheel teaching that she learned from Heyemehosts Storm, Joan Halifax, Emerald North, and others to many groups of children and adults over the years.